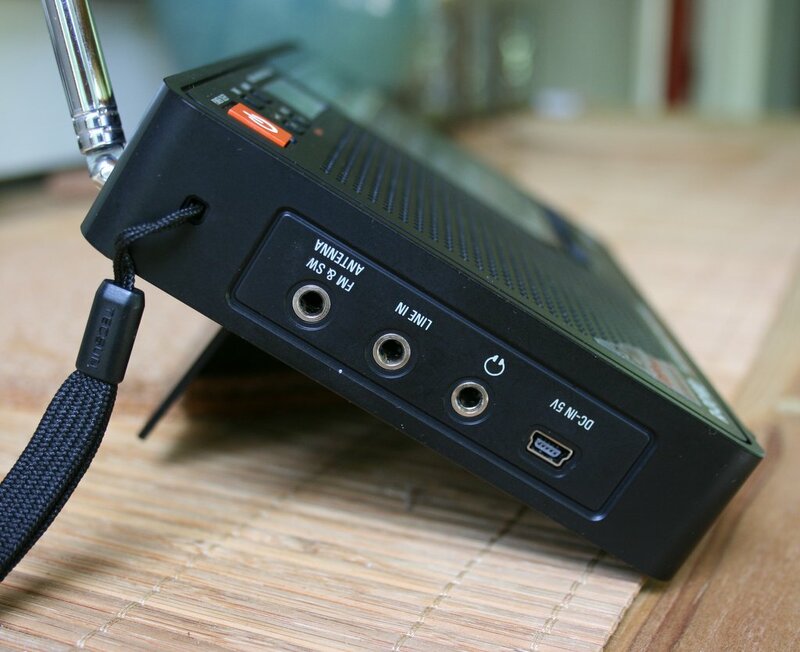 SiLabs DSP chips are now in the bulk of the newest portable shortwave radios on the market. And it’s no wonder: these small chips offer more features and improved performance, when properly implemented. Manufacturers love them, of course, because these little chips allow them to produce radios at a much lower cost–some of which they pass on to the consumer–for widening their profit margins. 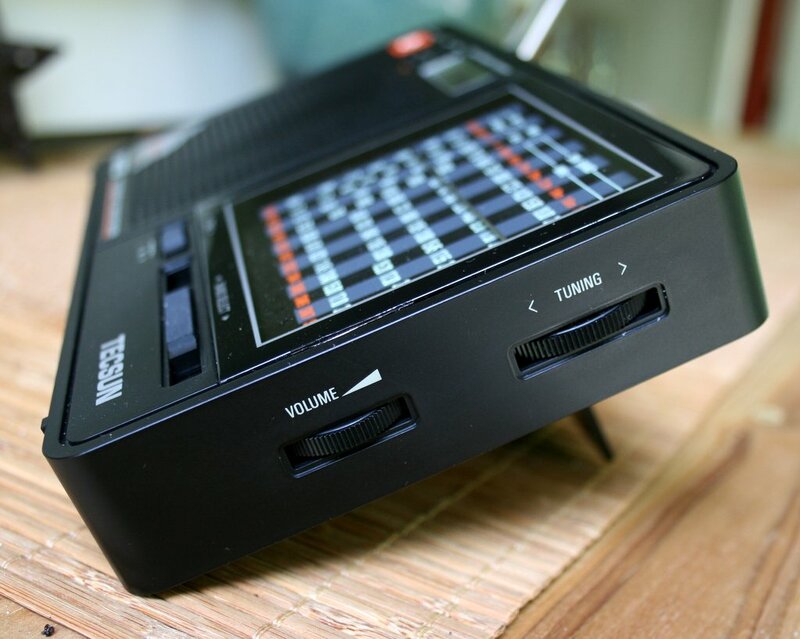 While there are a few other mechanically-tuned DSP portables on the market–the Degen DE321, DE32, Kchibo KK-9803, to name a few–the Tecsun R-2010D stands apart in that it has a digital frequency display. Tecsun was able to achieve this by building the R-2010D around the SiLabs Si484X chip set. The Degen and Kchibo models actually use the Silicon Labs Si4831/35-B30, which lack a provision for digital display. Tecsun first announced this receiver three years ago with the model number R-2010. Since then, I have received a lot of questions about this particular radio, so when I first heard that the R-2010D was available for purchase, I ordered one immediately from Anon on eBay. I received the R-2010D in less than two weeks via airmail from Hong Kong. It was packed in a padded envelope, and while the postal service wasn’t terribly gentle with the package (the R-2010D’s box had damaged corners) the radio inside was perfectly fine. My first surprise after pulling the R-2010D from its box was the discovery that it was much bigger than I thought it would be. I had assumed it would only be marginally bigger than the Degen models listed above; instead, it’s almost identical in size to my Sony ICF-SW7600GR (one of my largest true portables). Immediately, without even turning the radio on, I noticed that Tecsun had put more thought behind the R-2010D mechanics and ergonomics than either Degen and Kchibo had in their comparable models. First of all, the larger size means that the analog display is relatively large. One of the problems with the smaller portables is the difficulty in reliably tuning in a station on a tiny analog dial. With the larger dial, I could tell the R-2010D would be easier to tune accurately. The telescopic whip antenna is another strong point. Like pricier portables, it is fairly robust, long, and fully rotatable. This is a welcome departure from many portables I’ve seen lately that have puny, fixed-position telescoping antennas. I was even further shocked to notice a dedicated FM & shortwave antenna jack on the left side of the unit. Wow. My R-2010D also came with a nice carrying bag and a pair of headphones. While it lacked a set of Ni-MH rechargeable batteries (which can be charged internally), I was pleased with Tecsun’s choice of AA batteries instead of the thin Ni-MH proprietary battery pack the Degen models use. I’m one radio listener that is content having a slightly larger radio in exchange for powering my receiver with standard AA cells. Plus, I have a large collection of Ni-MH AA batteries and a charging station specifically for use in my portables (and you should, too–check out my previous post on the topic). I’ve had the R-2010D on the air for a few days, and have formed some initial impressions. I may follow up in the near future with corrections or further observations [spoiler alert: especially since there are serious issues with this model] but I feel pretty confident about my assessment, even with only a few days on the air. One commonality in all my previous reviews of mechanically-tuned DSP radios is the quirkiness of a precise 5 kHz stepped digital tuner with a vague mechanical analog display as interface. The combination, especially with a little muting between frequencies, makes for a band-scanning chore. I’m willing to bet that Tecsun realized this weakness and this is the reason they redesigned the radio around the Silicon Labs Si484X (sources tell me when Tecsun first announced the R-2010, they had planned to use the Silicon Labs Si4831 chipset). The Si484X chip allows the R-2010D to offer a precise digital frequency display next to the analog dial. Nice touch; you can accurately confirm your frequency! Secondly, the R-2010D analog dial is large, making the space between tuning steps more broad and therefore easier to find. In fact, the Tecsun excels in the tuning category. While there is some noticeable muting between frequency changes, it’s not as distracting as other models listed above. Additionally, the tuning wheel itself is silky-smooth to operate, much like higher-quality Sony and Grundig analog portables of the past. There is no lag time or “play” in my R-2010D’s dial. Another nice touch: the tuning needle is thin, making it much easier to precisely place the needle on your target frequency (you can then fine-tune with the digital display). Another strong point, of course, is audio fidelity. Being a larger portable means that the R-2010D has a larger front-facing speaker. Audio from the internal speaker is actually better than my Sony ICF-SW7600GR offers. Even better, the R-2010D has a three position tone control switch (low, medium, high). I find that for AM listening, the low position seems to strike the right balance, especially during summer conditions when high-pitched static crashes and pops are ever-present. On the FM band, I find that I keep the tone control set to medium. The high position is rather high and I find that I personally don’t use this tone position. While still on the topic of clear positives, I can say that the FM performance of the R-2010D is above average. It can easily receive my benchmark distant NPR station with little static or fading. I can also hear all of my local FM stations with ease. Any distortion or noise seems to be very low on the FM band. In terms of sensitivity, the R-2010D is great; very acceptable for a radio in the $40 US price group. I can hear stations with it that I cannot hear on my other mechanically-tuned DSP radios and, indeed, it seems to have sensitivity on par with my Tecsun PL-380. The PL-380 has a slight edge on the R-2010D, but only noticeable with the weakest stations. In fact, what probably gives the PL-380 an edge is its automatic gain control, which does a much better job of handling weak signal stations than that of the R-2010D. The R-2010D is not, however, as sensitive as my Sony ICF-SW7600GR (a radio three times the cost of the R-2010D). In my opinion, the biggest failing of the Tecsun R-2010D is its very poor selectivity. The second time I turned the R-2010D on, I tuned it to the morning broadcast of Radio Australia on 9,580 kHz. If you’re a regular here at the SWLing Post, you’ve probably heard one of the many recordings I’ve made of RA on 9,580; it has a blowtorch signal into eastern North America. Here’s what happened: I tuned the R-2010D to 9,580 kHz, only to hear China Radio International (CRI)–with beautiful fidelity, I might add. At first, I thought that perhaps the Radio Australia signal had gone off the air. I checked my WinRadio Excalibur SDR, however, and saw that the Radio Australia signal was one of the strongest in my 30 MHz bandwidth display. It was being broadcast with its usual strength out of Shepparton. CRI, though, had a blowtorch signal as well on 9,700 kHz; only 10 kHz away. The CRI broadcast might have been ever so slightly stronger than the RA signal. For some reason, the R-2010D could only detect the CRI signal; there was not even a trace of Radio Australia. I began to wonder if the R-2010D had poor alignment, so I tuned to other stations on the air, but found they were basically showing as broadcasting on frequency; alignment wasn’t the issue. The Tecsun PL-380 (no recording) could hear RA almost as well as the Sony. Upon further listening, I believe the selectivity may be poor in general, but it’s made worse by the fact that the only bandwidth setting is (obviously) rather wide. I came to this conclusion tuning through bands and locating another CRI blow-torch signal on 13,740 kHz. I could get a full tuning lock (indicated on the digital display) anywhere from 13,735 to 13,745 kHz. I could hear CRI, though, anywhere from 13,725 to 13, 755 kHz; a full 25 kHz spread! This explains why the R-2010D could not discern between two strong signals spaced only 10 kHz from each other. This complete lack of selectivity means that I simply cannot recommend the R-2010D for purchase. It’s most unfortunate, as Tecsun is known for quality products and the best DSP-based shortwave radios. For what it’s worth, I am going to forward this review to both the eBay seller and a contact at Tecsun. I feel like if the default bandwidth were narrowed even somewhat, it could help the R-2010D cope with adjacent signals much better. This could be a simple firmware adjustment, or worse case, a flaw in the receiver design. I find medium wave (AM broadcast band to us here in North America) to be mediocre; very similar to my experience with the Degen DE32 and DE321. I had no luck with weak MW stations at night. Probably a combination of poor selectivity and an over-active AGC circuit created a bumpy, wishy-washy experience on the air. While I could hear booming clear channel stations at night, the receiver had a hard time coping with adjacent signals–even strong stations sounded periodically garbled. During the daytime, however, I could easily receive my few local AM stations. 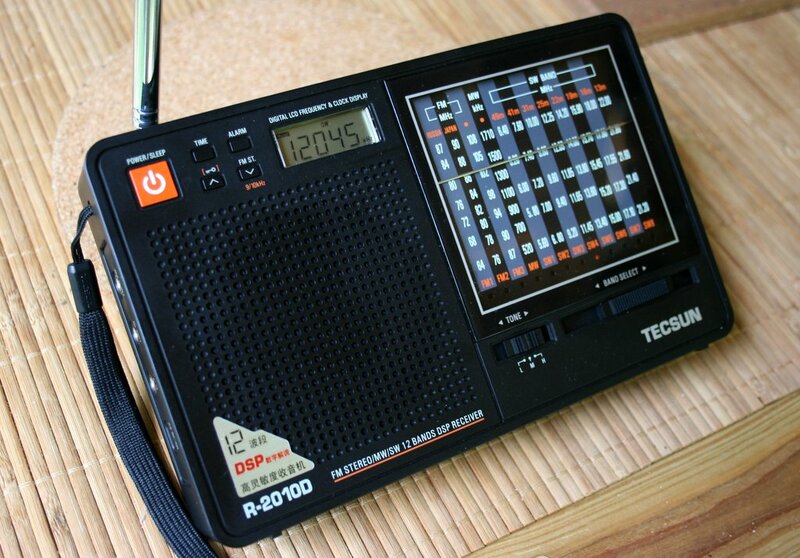 Unfortunately, I cannot recommend the R-2010D for medium wave radio enthusiasts. When I first pulled the R-2010D out of its box, I was most impressed. 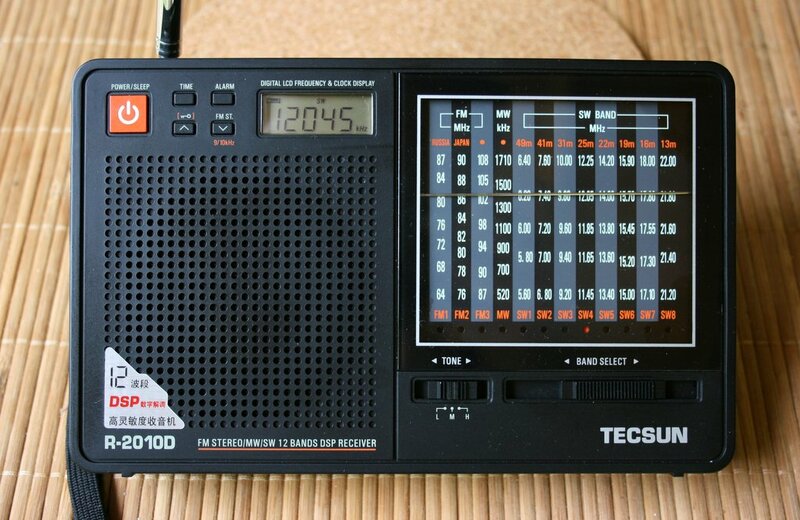 Tecsun had obviously thought through the mechanical engineering of this radio: smooth tuning mechanism, large accurate analog dial, small digital readout, beefy telescopic antenna, nice back stand, and overall quality “feel.” And audio, via the internal speaker, is brilliant: robust and room-filling. 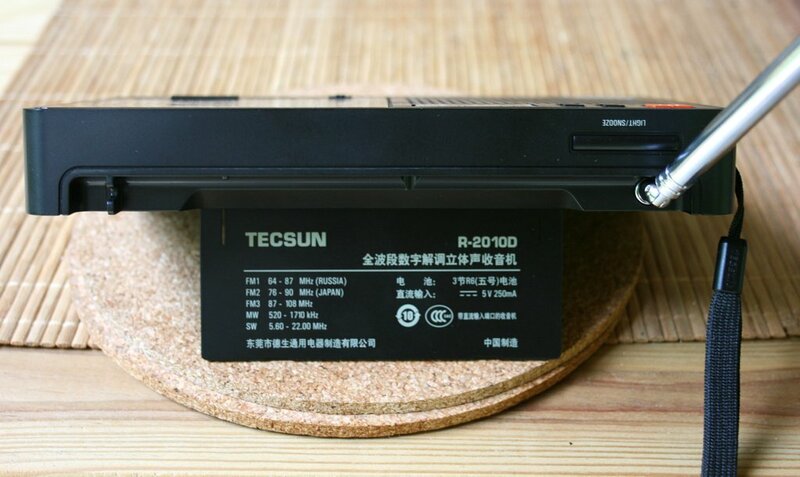 What Tecsun engineers put into the mechanical engineering, they left out of the receiver design. When you tune the R-2010D to a strong, isolated shortwave signal, it sounds great. However, the lack of selectivity is simply crippling on the shortwave and medium wave bands. Note that this review is only based on the particular Tecsun R-2010D I received (ser# 41420130600006). Should I test another–just in case this is limited to my particular unit, which I regret is highly unlikely–I will instantly update this review. Tecsun, in my opinion, is a good company, so I trust they will take some notice. Until then, I would wait to purchase the Tecsun R-2010D. I will also update this page with any response I receive from Tecsun. Meanwhile, if you purchased a Tecsun R-2010D as well, please share your thoughts in the comments section. This entry was posted in New Products, News, Radios, Reviews, Shortwave Radio and tagged R-2010, R-2010D, R-2010D Review, Reviews, Tecsun, Tecsun R-2010D Review on June 24, 2013 by Thomas. Could you post a video on youtube showing the TECSUN R-2010D on MW and SW? I see reviews on various websites but none shows it in operation. I am interested in buying this radio, I think the really cool idea the LDC display and analogue display. I’d like to see it playing to see if it’s really worth buying it. If you post the video, please let me know. Another review of the R-2010D. Well, I’ll get one when they fix the selectivity and use a real tuning knob. I hate thumbwheel controls with a passion. What I don’t understand is WHY didn’t Tecsun include the wide selection of bandwidth options available with the smaller DSP models (PL-310, 380, 390…)? Since they seemed to have thought out this radio more than a few other Chinese models based on these chips, this seems like a huge oversight. And from your review, one big fat bandwidth option was a dumb idea. While more options would be best, just a a moderate 3KHz for all AM tuning would have been much smarter. Great review Thomas, as always. The PL series uses a different SiLabs chip with more features. Still, I’m sure there’s a way to set bandwidth in the R-2010D’s chip. If not, it’s a bad design flaw. As you say, let’s hope they make corrections in future runs. I briefly had the Radio Shack 12-586 radio, an analog-style radio that apparently uses, I think, an SiLabs chip to “digitally tune” behind the scenes. It seems that this radio is similar. 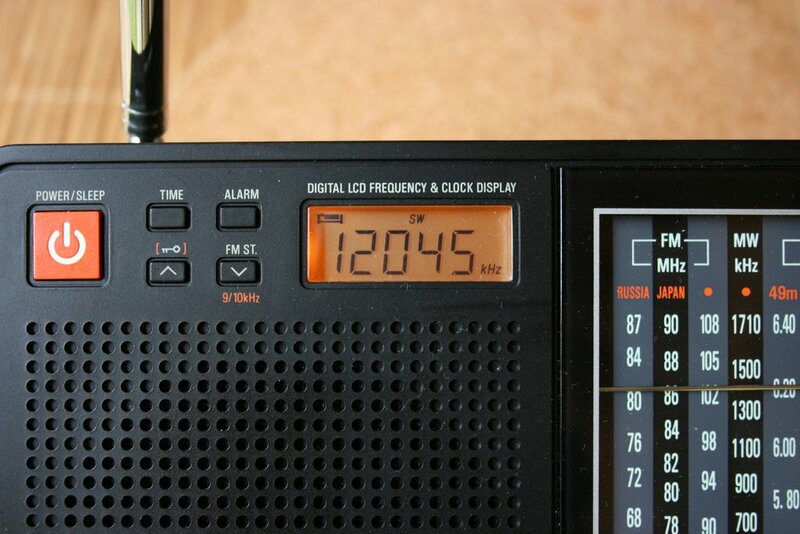 Here’s an AM bandscan video on the 12-586 while I had it. I noticed that when tuning the ‘586, it was jumpy, like it’d “snap to” the station. You could kind-of tune off in some cases, but the soft mute threshold was very severe. In parts of the dial were stations were far apart, you could tune to “blank” spots sometimes, though. One major flaw I discovered was that if there was a somewhat weak station next to a strong station (ones that my PL-398mp would have no trouble with even in the widest bandwidth setting), this radio would “snap to” the strong station, completely skipping the weak one. I ran several tests, some using another radio’s local oscillator output to generate a strong signal to lock onto. I’m wondering if the 2010D behaves in any manner similar to what I describe below? Test stations included 970 (19dB), 980 (22dB), 1050 (24dB), 1110 (22dB), 1150 (16dB), 1190 (19dB), 1290 (14dB), 1340 (15dB), 1490 (16dB), 1520 (12dB), 1580 (10dB), 1650 (6dB), 1670 (12dB) and maybe a couple others. (I generally limited the test to weak stations separated at least 20 kHz from the strong locals. I use the term “locals” loosely, as 1070 KNX is from L.A., 111 miles to the NW. KFI on 640 is 99 miles, clocking in at 45 dBµ.) Tuning across normally would completely skip those stations, instead locking on stations like 950 (51dB), 1000 (43dB), 1030 (42dB), 1070 (48dB), 1090 (53dB), 1130 (76dB), 1170 (81dB), 1210 (53dB), 1270 (50dB), 1310 (44dB), 1360 (67dB), 1470 (58dB), 1550 (35db), 1630 (53dB), 1700 (49dB). Using the local oscillator to generate the strong carrier, then turning off the other radio, would often allow those stations to be heard. Sometimes, though, strong modulation on the nearby strong signal would cause the radio to snap to it spontaneously. Also turning the 12-586 off then on, it would snap to the strong station, or sometimes to its sideband splatter. Does the 2010D behave in a similar manner? Could you, with another signal source, generate a carrier on a weak station’s frequency to aid in tuning? Then will it stay locked on, or will it snap to the strong local signal? That’s an interesting idea. Bravo for trying that out on the RS radio. It does indeed sound like it has a DSP chip of some sort. Not terribly surprised; those chips decrease manufacturing costs significantly. I might try that method sometime. I think the bandwidth may be a limiting factor, but I’m uncertain where it it set in the R-2010D. So basically there is no way to tune slightly away from a MW or SW signal to get around some interference. This, together with poor selectivity make this a non-starter. It is not clear from your review whether you can actually tune in between 10 kHz (MW) or 5 kHz (SW) stations/broadcasts. When you tune to say 5975, will the next station tuned be 5980, or can you fine tune to say 5977, even though the digital display may still show 5975? Tuning increments are only in 5 kHz steps on SW. This was a limitation with the other mechanically-tuned SiLabs DSP chip. Fortunately, you can chage between 9kHz/10kHz on MW and there are FM bands for Japan, Russia and the rest of the world. You might be happy to know that the volume control does not use step increments. In fact, it’s very much like a traditional volume pot; completely variable. It will go down to a very low volume as well. Excellent for a quiet environment. I received China Radio International on 9580 as well in the past. In fact I listened to it on Saturday sometime when they talked about Snowden and his girlfriend. Also I have listened to Radio Australia as well on that frequency. If you heard China Radio International , you probably heard it being relayed from Radio Cuba as that is where I tracked it down when I listened to it with my radios using http://www.short-wave.info/index.php at the time it was being broadcast. Yes, CRI comes on 9580 kHz at 1:00 UTC. At the time I made these recordings, they were only on 9570; the R-2010D simply couldn’t hear Radio Australia on 9580 because CRI’s 9570 signal overwhelmed it. CRI is, by far, the most ubiquitous international broadcaster on the shortwave. I missed their Snowden coverage. I’ll have to follow them tomorrow!